Little Bit of History: This game was loosely based on the film of the same name. It was developed by Denton Designs and published by Ocean Software. 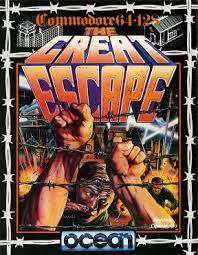 Released in 1986 on Amstrad CPC, Commodore 64, ZX Spectrum and DOS. Little Bit of Plot/Story: Simple enough plot which had you trying to escape the prison. Little Bit of Character: Not too much to cover as you played as an unnamed POW and interacted with other unnamed POWs and prison guards. Little Bit of Influence: Alas there are very few games that have used this concept as a template today. But with it’s open ended gameplay, multiple ways to complete, it was a forerunner for open world games. There have been other similar games like Escape From Colditz (1991) on the Amiga, a remake (of sorts) released in 2003 and more recently Prison Life RPG on IOS. Little Bit of Memories: I loved this game as a kid and still find appeal in it today. I recall being able to play it over and over and doing things different every time. Having to keep to a strict daily routine while also planning your escape. If you left the game alone for a while, your prisoner would automatically keep to this routine. Finding new ways to escape and items to use, trade, etc would mean you could play the game over and over differently each time. Little Bit of Playability: It’s still playable, but I personally found it very slow moving by todays standards. But at it’s heart is a great and “unique” game that encourages multiple and different playthroughs, thinking and strategy. 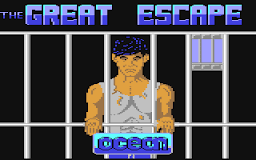 This entry was posted in LBoG: Game Overviews and tagged c64, game reviews, Little bits of gaming, retro gaming, Retro gaming blog, The Great Escape, ZX Spectrum on 16/04/2015 by Steve Perrin.